The establishment of SOP Plagiarism was protracted. 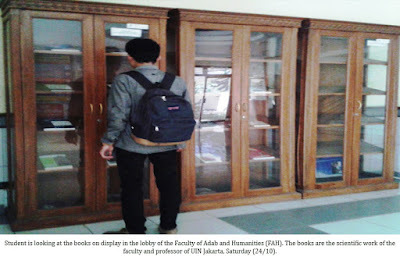 UIN Jakarta seriousness in handling plagiarism being questioned. So far, the Senate Ethics Committee of the State Islamic University (UIN) Syarif Hidayatullah Jakarta still formulating Standard Operating Procedure (SOP) for plagiarism which will be completed in the end of 2015. Chairman of the Institute of Quality Assurance (LPM) UIN Jakarta, Sururin explained before SOP is applied, there must be a decree (SK) Rector first. "If SK rektror already exists, SOP can be considered as guidelines to handling plagiarism," he said, Wednesday (21/10). Sururin explained, the absence of SOP could trigger problems in measuring the level of plagiarism. "We do not know how much percentage of a scientific work can be regarded as plagiarism. So any sanctions could not be determined, " she said. Up to now, to deal with plagiarism on campus, State Islamic University (UIN) Syarif Hidayatullah Jakarta only refers regulations of National Education Minister (Permendiknas) of Republik Indonesia (RI) number 17 of 2010 concerning the prevention and control of plagiarism in college. In Article 1, paragraph 1 Ministerial Regulation No. 17 of 2010 describes plagiarism is the act of intentionally or unintentionally in obtaining or trying to obtain credit or value for a scientific work by quoting part or all of the work and or scientific work of others who are recognized as scientific work without stating the source appropriately and adequately. Then the article 2, paragraph 1 points a stated plagiarism include but are not limited to refer and / or cite the terms of words and / or phrases, data and / or information from a source without citing a source in the records of citations and / or without stating the source adequately. Four months ago, LPM received a report acts of plagiarism by a lecturer in UIN Jakarta. But plagiarism cases are yet to be passed as an act of plagiarism. "SOP is still in process. We want to create a legal framework to harmonize all the rules of the handling of plagiarism in UIN Jakarta, "said Sururin. Questioning the process of making the SOP, the Secretary of the Senate Ethics Committee UIN Jakarta, Amany Lubis said that this year there are four things that are being designed by UIN Jakarta Senate Ethics Committee they are the ethic codes of students, faculty, staff, and institutional UIN Jakarta. Actually, cleared Amani, the ethic codes of academicians already exist, but need to be adjusted again because there are no detailed rules regarding plagiarism. Although do not have its own rules related to plagiarism, Amani explained UIN Jakarta actually follow Permendiknas number 17 in 2010. "If there is a case of plagiarism, faculty, rector and also his staff should be able to act with the sanctions even though there is no regulation from the campus," she said, Friday ( 18/9). According to the Vice Rector for Academic Affairs, Fadhilah Suralaga, social and moral sanction will be given to the acts of plagiarism that is not associated with the acquisition of a degree. Sanctions are for instance the perpetrators of plagiarism would not get more confidence from other academic society. "Then when it comes to titles, sanctions may be a delay of promotion or dismissal," said Fadhilah. Meanwhile, according to the Rector of UIN Jakarta, Dede Rosyada, the Senate Ethics Committee UIN Jakarta does not have the authority to propose sanctions to the rector for perpetrators of plagiarism. Thus, continued Dede, immediately UIN Jakarta will establish a Court of Ethics is authorized to sanction recommendation. "Rector received the sanction of the Court's recommendation of Ethics. However, the rector can only give an oral reprimand and a written warning only. The rest submitted to Kemenag, "said Dede. Plagiarism cases are often occur in some universities in Indonesia. In 2013 ago, the Ministry of Education and Culture (Kemendikbud) recorded 808 plagiarism cases in the certification process for lecturers. Entering the end of 2014, the Rector of UIN Maliki, 80 percent of his book has been accused of plagiarizing papers of nine graduate student UIN Malang. The enormous number of plagiarism cases made University of Indonesia (UI) has it is own way in preventing acts of plagiarism. UI has software that is used to detect the scientific work the entire academic community college. Also, about regulations, UI already has Decree Rector of the University of Indonesia No. 208 / SK / R / UI / 2009 on guidelines for the settlement of the problem of plagiarism. In response, Dede said, UIN Jakarta as soon as possible will buy anti-plagiarism software. "Actually, to detect plagiarism can be a way manually examine the scientific work in question. But we try in 2015 or early 2016 UIN Jakarta already has a plagiarism detection software, "he said, Friday (23/10). In addition to buying anti-plagiarism software, the most effective prevention efforts, according to Dede is sanctioning the perpetrators of plagiarism. According to him, the deterrent effect will arise after the punishment. "Plagiarism is a crime in academic for taking people's work without mentioning the source. He (actors) want to look smart but actually not, "he concluded.